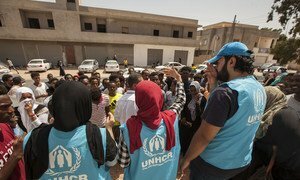 “At the same time, I am particularly worried with migrants and refugees that were caught in this terrible situation”, he added, saying he was glad that UN Refugee Agency, UNHCR, had managed to evacuate detention camps around the capital. “But there are terrible concerns in relation to, not only the lives of the Libyans, but also the migrants and refugees in the city and other foreigners in the city and one reason more for us to believe that we absolutely need to stop this fighting”, he told correspondents in New York. Asked about his view on what the Security Council should do at this point, he said: “It is very clear for me that we need to restart a serious political dialogue and a serious political negotiation, but it is obvious that that cannot take place without fully stopping hostilities.” (SOURCE: UN News).